CORSAIR ONE takes fast, quiet, small, and beautiful PCs to a previously impossible level. Featuring custom CPU liquid-cooling technology and producing less than 20 dBa of noise at idle, the CORSAIR ONE is quieter than a whisper. Premium material construction, soft bead blasted aluminum chassis, and subtle ambient lighting effects come together to complete its unique, compact form-factor. 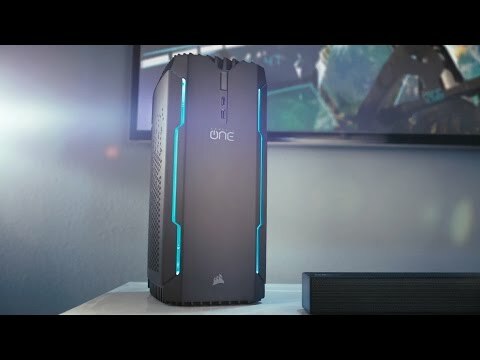 The CORSAIR ONE is designed specifically to deliver true VR and 4K gaming to your living room or den. *The Corsair ONE features only CPU liquid cooling. Image for reference only. Power of ONE: We’ve taken fast, quiet and small PC’s to a previously impossible level with custom liquid-cooling technology and a design to maximize cooling. Powerful Components: Delivers a true 4K and VR experience with the power of liquid cooling to the CPU, ensuring a cool PC even on those extended game sessions.